Barstool Sports’ “Pardon My Take” is less than two years old and yet is consistently one of the top podcasts across all subjects. Its success has come despite its lack of association with a large traditional media outlet. With The Chernin Group’s additional $US15 million investment in Barstool late last month, it’s unlikely the podcast’s success will end anytime soon. Though Super Bowl media day is a time for the teams to answer both serious and playful questions from dozens of media outlets from across the globe, Barstool Sports, one of the fastest-growing in the US, continues to find itself on the outside looking in. The site, which controversial but incredibly popular among men aged 18 to 34, has frequently clashed with the NFL over the past few years. It shouldn’t be a surprise that the league is trying to distance itself from Barstool. 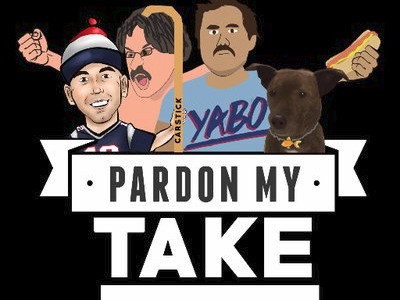 PFT hosts perhaps Barstool’s most popular entity, “Pardon My Take,” along with Daniel “Big Cat” Katz. The podcast is a comedy show disguised as a sports show where the pair dive int0 the day’s top sports stories by making light of the hot takes typically made by talking heads across the industry. The show does this through satirical segments such as “Mount Rushmore,” in which the two, their producer Henry Lockwood, and a guest pick a “top four” in a random topic, like road-trip activities or hangover cures. They say the idea is to poke fun at all the contrived debates that sports talk shows use to fill time. They will also frequently dive outside of the sports world into entertainment, with segments like “Bachelor Talk for People Who Don’t Watch ‘The Bachelor'” and a “Game of Thrones” recap (though neither has a clue what’s going on in the show) designed to satirize the many sports shows that feel the need to dive into pop culture. The podcast is known for having loyal listeners who frequently “subscribe, unsubscribe, then resubscribe,” which is why “Pardon My Take” is consistently at or near the top of the charts for sports podcasts. But how did the podcast get here less than two years after debuting? Katz and PFT Commenter told Business Insider how “Pardon My Take” came to be. Katz was working in real estate in Chicago when he had a quarter-life crisis and decided he wasn’t cut out for the corporate world. He wanted to switch to the “fun thing,” which for him was talking about and writing about sports. It started out as just an email to his friends, but in 2012, Katz started blogging for Barstool Sports from his apartment – long before it had hit the mainstream and when it had about five people. PFT started out as a comedy writer but temporarily gave it up for an office job in Austin. He got bored with his days, so he made a Twitter account to make himself laugh. He began to gain notoriety for his Twitter account and comments on sports sites such as ProFootballTalk and started to get contracted to contribute to various blogs under his pseudonym. The two got hooked up through people who read them online. They met for beers in Chicago and remained in contact with each other for the next couple of years. In early 2016, when the media company The Chernin Group invested in Barstool, PFT was one of the first people Katz and Portnoy reached out to when they were looking to expand Barstool’s talent base. Chernin Group made an additional $US15 million investment late last month. PFT and Katz recorded their first “Pardon My Take” podcast in February 2016, and within a week it was the top-ranked sports podcast and in the top 10 overall. Though the two say their first few episodes were “trash,” with awful sound bites and an inconsistent pace, they credit fan feedback and their ability to adapt quickly with the early, continuing success of the show. Their immediate popularity wasn’t always positive, however. In March 2016, they received a cease-and-desist notice from ESPN, claiming the podcast’s name and logo were infringing on two of the network’s popular sports talk shows, “Pardon the Interruption” and “First Take.” The logo would have to change, but the two used the letter as ammo for more comedic content – they sent ESPN a cease-and-desist on sending further cease-and-desists. While the downloads were immediate, it took some time for Katz and PFT to realise they had arrived. Later that month, multiple media outlets picked up the podcast’s interview with Kyle Wiltjer, a former Gonzaga basketball player, who claimed that Adam Morrison, another former Gonzaga player, had an apocalypse bunker in his house, marking the first time the mainstream really noticed the show. In the summer of 2016, they landed Scott Van Pelt, ESPN’s premier “SportsCenter” anchor, as a guest on the show. Katz says that interview was a major reason he and PFT have been able to regularly get such famous guests in the year and a half since. PFT says he also sees the show’s interview with the controversial sportscaster Joe Buck that summer as a major moment for the show. “No matter what team you root for, you think Joe Buck hates your team,” the host said. So when their Twitter mentions filled with hundreds of comments like “damn you, I can’t believe you made me like Joe Buck,” PFT knew they had a special ability to humanize larger-than-life personalities. While the show often sees a spike in downloads if the guest is big enough, its most loyal listeners keep it near the top of the charts regardless of who’s on – notoriety that has led to partnerships with major networks. During the week of the Super Bowl last year, Barstool’s “The Rundown” featuring Katz aired nightly on Comedy Central. 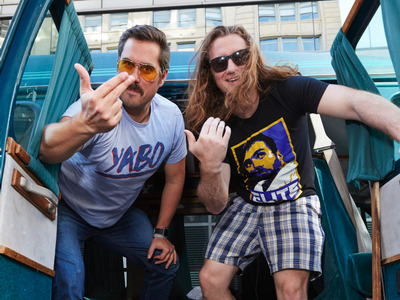 Last fall, the “Pardon My Take” team launched the “Barstool Van Talk” on ESPN2, though ESPN canceled it after one show. The two said those experiences made them how important it is to their fans to not give up creative control, especially amid big changes in the media landscape in the past few years. Katz and PFT say they’re confident they can continue to grow their audience without attaching themselves to a major network – but they wouldn’t rule out a partnership that made sense, as long as they maintained creative freedom. They said they considered themselves extremely lucky that they get to work for an outlet that they say allows for so much creative freedom – something they point to, along with a feeling of community between Barstool employees and their audience, as a reason for their success in the two years since launching the podcast. And with The Chernin Group’s recent investment, there’s no reason to believe their success will end anytime soon.